Hello friends! 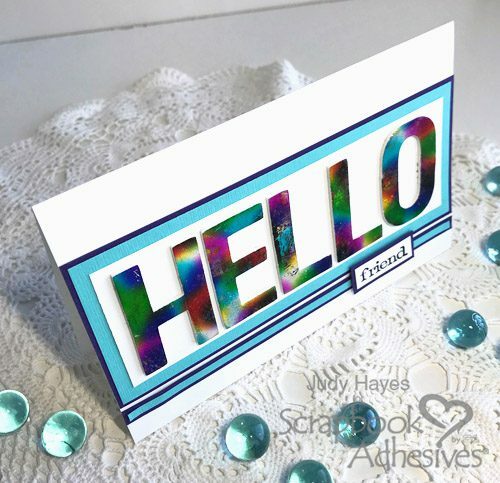 Sharing a bold Holographic Foil Hello Card today featuring the NEW 3D Foam Creative Sheets Medium White and Metallic Transfer Foil Sheets Holographic Colors. This rainbow foil in the pack looks so pretty on the letters, don’t you think? First, I die-cut the letters with the steel rule die and the 3D Foam Creative Sheets Medium White. 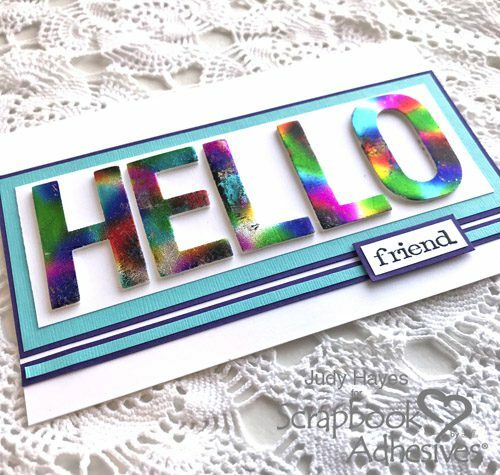 Take off the top liner of the cut letters and apply the rainbow foil from the Metallic Transfer Foil Sheets Holographic Colors pack on top – COLOR SIDE UP. Gently rub the foil to transfer the color to the foam letters and peel off. If there are missed areas, simply re-apply until you get your desired coverage. Love the bright multi colors! Truthfully, I wouldn’t usually choose something so bold and bright but I stepped out of “my box” a bit for this card! Next, take off the bottom liner of the foam letters and fastened to a white cardstock panel. So easy to stick them in place. Designer Note: I used a ruler along the bottom to align them straight. 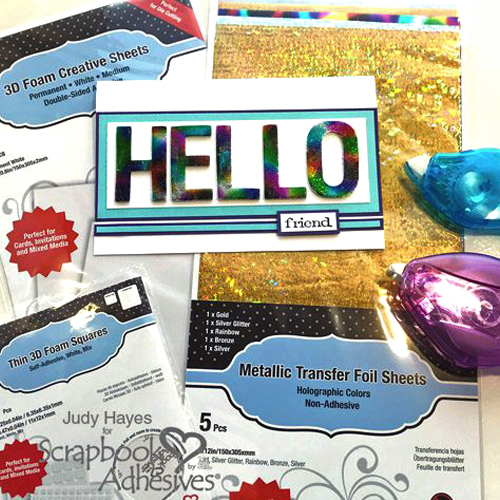 Then add turquoise and purple card panels with the NEW E-Z Runner® Petite Permanent Dots Refillable Dispenser. I love the size of it! Great for traveling and has 26 feet of adhesive – not bad for a little guy. When putting together my narrow strips of turquoise and purple, I used E-Z Runner® Micro Refillable Dispenser. The narrow adhesive fits perfectly! Fasten the layered strips onto the card. Stamp “friend” on a piece of white cardstock with black ink and clear heat embossed it. Then mat it onto purple cardstock with E-Z Runner® Petite Permanent Dots Refillable Dispenser and pop it up on the card with Thin 3D Foam Squares White Mix. Here’s a couple more image as I try to capture the colors and shine. Such a fun pop of color and it looks different depending on how the light hits it. This entry was posted in 3D Foam Creative Sheets, 3D Foam Squares, Adhesives, Cards, Crafts & Tutorials, E-Z Runner® Dispensers, Intermediate, Metallic Transfer Foil, Permanent Adhesive, Skill Level, Tutorial, Wear your Adhesive on the Outside and tagged 3D Foam Creative Sheets White Medium, Card, Card Making, E-Z Runner Micro Refill, E-Z Runner Micro Refillable Dispenser, E-Z Runner Petite Refillable Permanent Dots, E-Z Runner Petite Refills Permanent Dots, Friendship, IMAGINE Crafts/Tsukineko, Judy Hayes, Metallic Transfer Foil Holographic, Spellbinders Paper Arts, Thin 3D Foam Squares White. Bookmark the permalink. 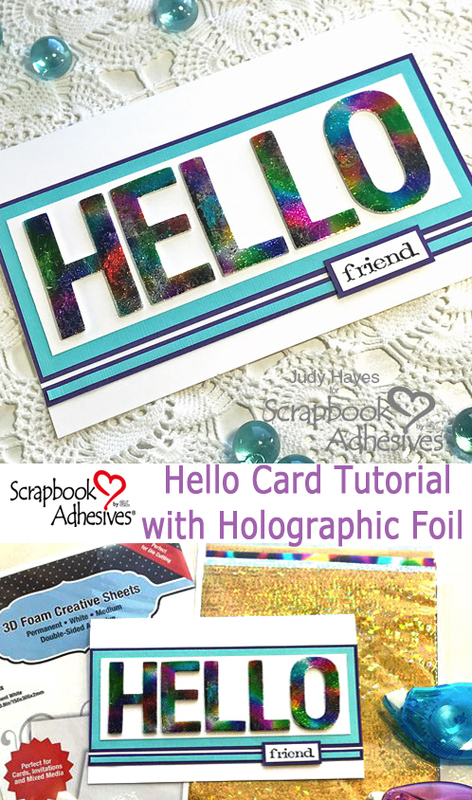 One Response to "Hello Card Tutorial with Holographic Foil"
I love your pretty creation!